Civil Defence officers help to move furniture at a house submerged by flood waters. 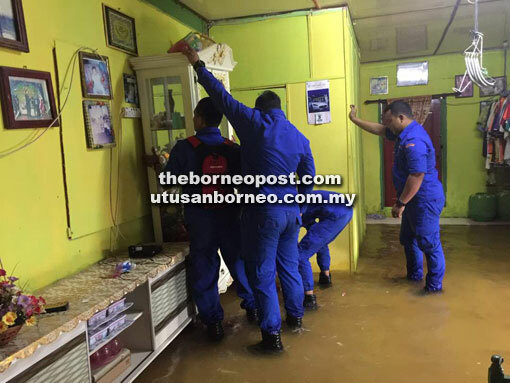 BETONG: Several houses at Kampung Baru Hilir here were under water due to the king tide and heavy down pour on Monday. The residents were frustrated that they had to clean the muddy floor of their houses and remove damaged furniture after the flood yesterday. They complained that the flood would not have happened if the authorities had constructed the monsoon drains according to specification. The villagers called the Civil Defence Department and the Fire and Rescue Department here to help them move their properties to higher grounds. A senior fire officer here, Henry Jugah, meanwhile said they would be monitoring the situation in the affected areas from time-to-time. “Water in the river will likely rise again resulting in flood. “We hope the villagers will be ready this time because the same thing is going to happen at low-lying areas in Sarawak,” he said. The Welfare Department here was also informed of the flood and is prepared to provide assistance to the victims.